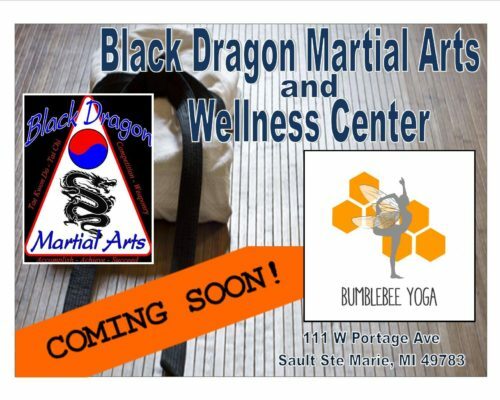 Black Dragon Martial Arts and Bumblebee Yoga | Downtown Sault Ste. Marie, Michigan! Soft opening on June 1st, 2016. Hours for open class will be Wednesday thru Friday 5:30 – 8 for martial arts to start. Grand opening will July 4th. Yoga classes will start then too. 10am on Saturdays for parent and child family partner yoga. Noontime Tues- Thurs yoga flow. $40 for an 8 class punch card good for 2 months (makes it $5 a class) $8 dollar drop in. Address:111 W. Portage Avenue on the second floor of the Alpha Bar annex, next to Zorba’s.